The Solway Coast Area of Outstanding Natural Beauty was our first serious contributor, a generous grant from their Sustainable Development Fund enabled us to take 120 youngsters from deprived wards in Cumbria on to the Solway Firth in 2006 to not only learn about fishing but gain an introduction to this nationally scarce habitat and the invertebrate, plant and wildlife communities it supports. 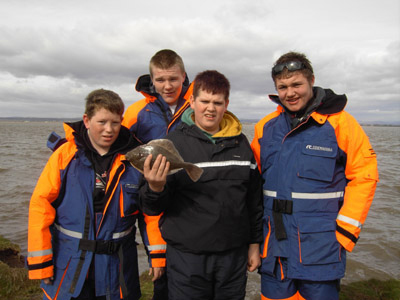 Solway Firth flounder fishing day with Wigton Youth Station. Shakespeare and Daiwa have also supported Borderlines with various projects by providing tackle at substantially discounted rates. With all of our sessions safety is paramount, this is particularly so with sessions involving youngsters, during the last decade or so several tragic incidents have occurred on school out of bound trips. If we allow coaching standards and attention to detail to drop, an incident such as this could happen within angling, such incidents illustrate all too graphically the need for constant vigilance, by properly trained and qualified angling instructors. As coaches we have a duty of care to maintain coaching standards and attention to detail to provide a safe and secure environment in which to learn angling. 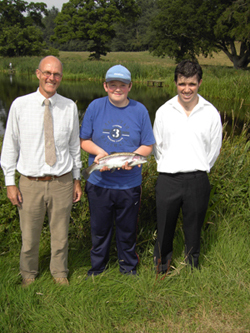 Angling instruction for Borderlines is provided by Clive Mitchelhill, Glyn Freeman, Derek Kelly (Borderlines Company Secretary), Roger Smith and Chris Bowman. Clive, Glyn and Derek are all members of A.A.P.G.A.I. the (Association of Advanced Professional Game Angling Instructors) and F.F.F. (Federation of Fly Fishers). Chris is a Professional Anglers Association registered coach. As members of these organisations, Borderlines is able to draw on other qualified instructors to deliver larger projects and cover a wider area. The desired outcome at Crofton Lake! The study of their own local environment and lives can motivate young people to enjoy practising skills of writing, reading, drawing, measuring, calculating, designing and public speaking through approaches that make learning relevant and applied. There is a large body of research that illustrates the importance of environmental experience and contact with nature in childhood to promote children’s physical and mental health and well being. 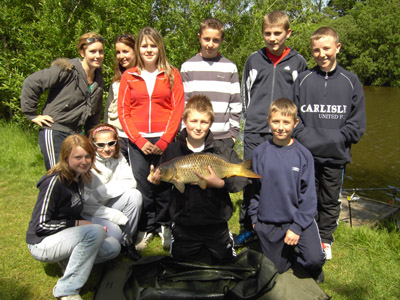 Things are now going full circle, we are getting youngsters that have attended our junior angling courses doing their works experience with us, some have become very competent anglers. 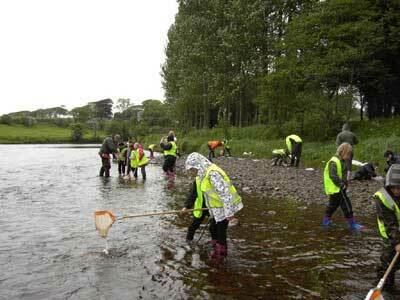 They will become the angling coaches, tackle dealers and fishery managers of the future. We are not just showing people how to catch fish, we are casting better futures and if all of us within angling and it’s allied industries work together on this, things as they say, can only get better. Please do take the time to explore this site.